I am happy to report that this past week was one of the best weeks we have experienced, thus far. The students were settled and attentive and there were very few students who needed consequences for inappropriate behavior. This week I was proud to be their teacher! I am looking forward the students understanding of my expectations, and learning what is expected in being a fourth grader. If your student is treating my teaching time as recess time, they will be sent to another classroom to do focused work, for a short amount of time. I will let you know if your child was sent out of class. If you receive an email from me because of such event, please let you child know that you take this very seriously. It is important that your child be able to redeem him/herself. I suggest that they do extra chores or lose privileges that they would have otherwise been given. School is their job, and if they perform poorly, there are natural consequences to their actions. If we all work together, they will build a healthy habit of redemption and good work. This week I introduced the students to the California Missions. I presented the Mission history through the viewpoints of both the Native Americans, as well as the Spaniards. Ultimately, I want the students to know of the important historical events which took place in our state. I brought the Mission story to them by telling a story of a Native American woman’s struggle to keep true to her own cultural roots, while embracing the new opportunities that the Spaniards were bringing to the people around them. Additionally, the students were asked to work in groups in order to create a short, one page story about an animal and the region in which the animal lived. Some found this social group-work difficult, while others were able to cooperate and finish their work. Many students took the assignment as a game, and tried to create a story that was funny, however, this was inappropriate for school. This in itself was a great lesson. In fourth grade, the students will be expected to do their best. I recognize that this is different for each child, and I will ask students to redo their work if I determine that it is not their best effort. Many students have found it challenging when I hand back their comprehension sheets because I am finding that most are not writing in complete sentences. We ended the week with a brief introduction about Fort Ross. 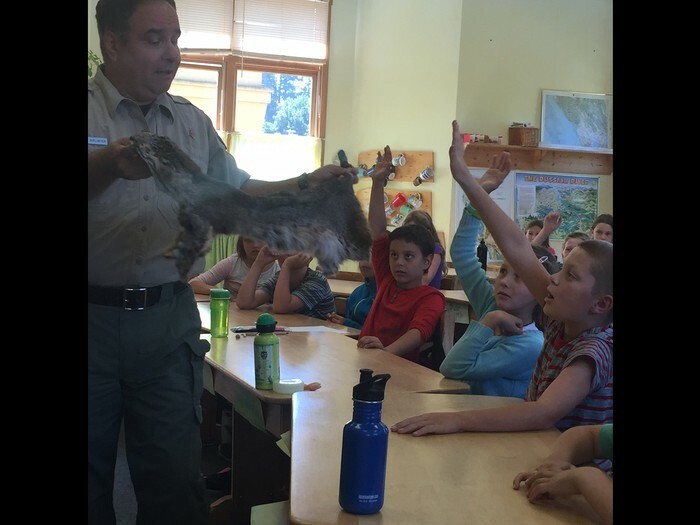 They will hear more about Fort Ross as our field trip approaches. Monday will begin our Math Block. We will review long division, long multiplication, place value and move into an introduction of fractions. I asking for 4 families to bake something, like a pie or brownies, so that the class can physically divide it into fractions. Please bring it in on Friday, during this block, on the following dates: 9/23, 10/7, 10/14. We won't need "fraction food" on September 30th, due to the Festival of Courage. Please email me if you think you would be willing to bring in some "fraction food". Our class walk went well this past Friday and I would like to again extend walk invitations to all parents. 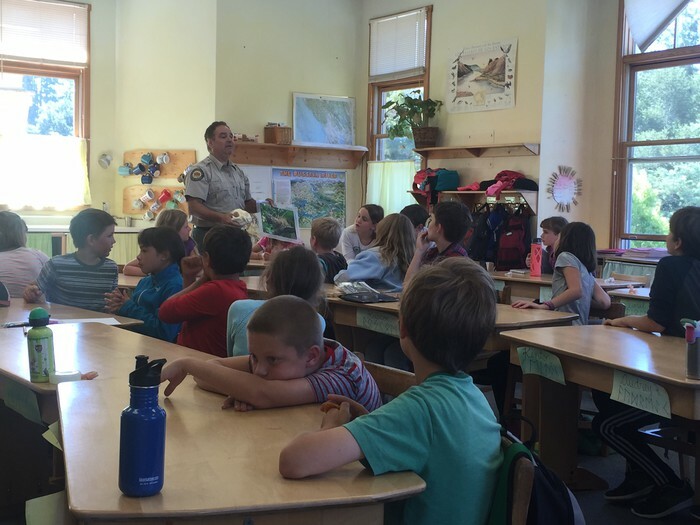 I had a special guest come in on Wednesday to give the class an "In-class field trip". 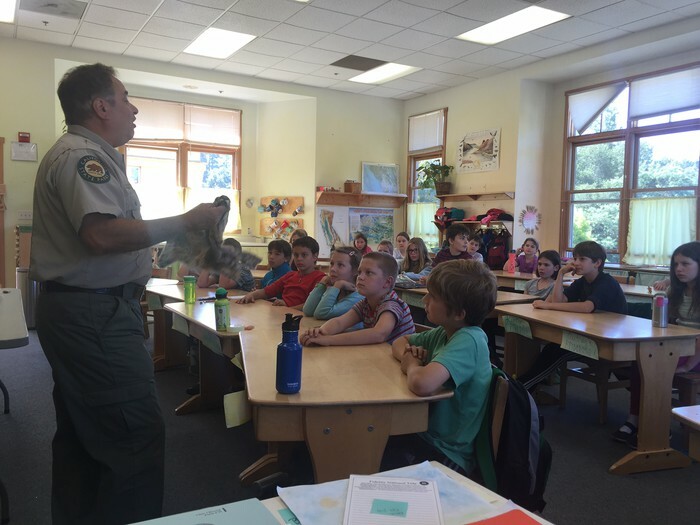 Ranger Dave came to our class and spoke about our National and State Park System. He showed the class many animal skins from animals that live in our local area. The class was very respectful and they were on their best behavior! I was proud of the respect that showed to Ranger Dave. Homework Sheet Due Monday! Please Sign and Help Your Student Remember! Please help your students to remember their binders everyday. I will remind them to take them home, and ask you to remind them to bring them back. If the binders live in their backpacks, this will be easier for them to remember. I have only heard back from one parent! Please come help! On September 30th, I am looking for 4-6 parent volunteers who can crochet or knit, to help work in the classroom during morning lesson (8:30-10:25 AM). Our class will be doing a service project where they will be creating bird nest for the local bird rescue and also creating a quilt for the homeless shelter. You will need to have filled out a volunteer form in the office. If you are having trouble finding childcare for Thursdays meeting, please contact me, as I have a solution! I do hope that every student will have a parent represented at our first parent meeting. I feel that the first one is the one that holds the whole year. If you can prioritize that first meeting, it will help me know that you understand where we are, and where we are going. If you attend no other meeting this year, please come to the first one! I will also have a Waldorf Alumnus (1st-12th) there to answer questions about her schooling experience, and what it is like now, out in the real world. Our annual "Festival of Courage" will be held on September 30th. Please join us and bring a picnic and a blanket to share the changing of the season with our wonderful community. Please remember that this is a short day. I will require that you come retrieve your child from me. I will not let them go unless I have made eye contact with a parent or guardian. Any child left after pick up (12:45), will be taken to the office.